The HHS press release is available here. Medicare is a US government-funded medical insurance program for people over 65 years, younger disabled people and dialysis patients, according to the HHS website. The countries compared in the HHS study include the United States, France, Portugal, Austria, Germany, Slovakia, Belgium, Greece, Spain, Canada, Ireland, Sweden, Czech Republic, Italy, United Kingdom, Finland, and Japan. “All of this means that the Medicare program and its beneficiaries spent an additional $8.1 billion—47% more—on these drugs than it would have if payments were scaled by the calculated international price ratios,” HHS Secretary Alex Azar said in a post on Twitter. The pharmaceutical industry offers “deep discounts abroad while taking advantage of the payment system in Medicare Part B which drives the cost in the U.S., even though Medicare is the world’s largest drug purchaser. The IPI [international pricing index] model would take on this issue and pay vendors for Part B drugs at a level approaching international prices,” the HHS release states. “Reduce costs for Medicare beneficiaries, and thereby increase adherence and access to prescription drugs. Introduce competition to the system of paying for physician-administered drugs by bringing in private-sector vendors. Reduce providers’ burden and the financial risk associated with managing drug inventories, so physicians can focus on patient care. Maintain financial stability for physicians while removing incentives for higher drug prices. Address the disparity in drug prices between the U.S. and other countries. “The far bolder plan we need to make medicines affordable would confront the power of Big Pharma corporations. The American people want their leaders to challenge pharma head-on. Instead, Trump yells from the back of his horse at allies who could help make medicine affordable for all,” the statement concludes. 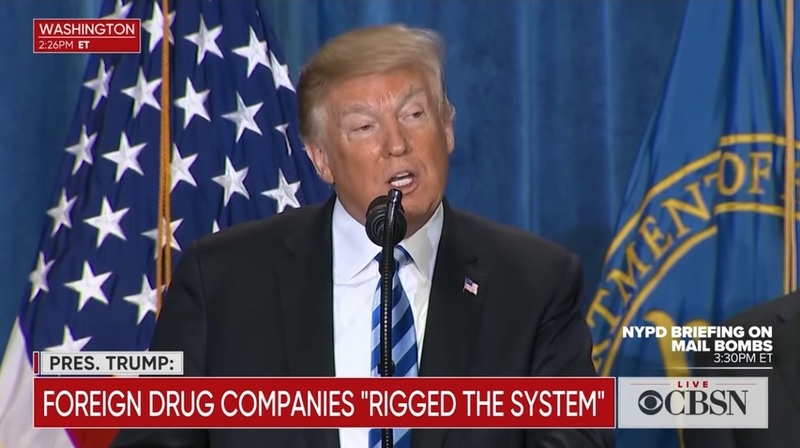 Prominent pharmaceutical industry groups Biotechnology Innovation Organization (BIO) and Pharmaceutical Research and Manufacturers of America (PhRMA) responded critically to Trump’s announcement of the new Medicare drug plan. "US Releases New Medicare Drug Plan To “Pay The Prices Other Countries Pay”" by Intellectual Property Watch is licensed under a Creative Commons Attribution-NonCommercial-ShareAlike 4.0 International License.